The US-China trade war escalated last week, with China targeting US oil products and coal for the first time with a 25% tariff in response to another round of US tariffs. Commodity markets will continue to watch the implications of this latest development on trade flows. In oil, light sour Middle Eastern crude grades may struggle to sell in the Asian spot market this week amid strong competition posed by US Eagle Ford crude and condensate and Far East Russia's ESPO blend crude. In agriculture, the front-month New York No. 11 raw sugar futures plunged to over a 10-year low on August 22nd to 9.91 c/lb, amid a global supply glut, and weaker Brazilian real and Indian Rupee. Policy announcements that could keep the market on its toes this week include the Indian government's extension of the 2 million mt sugar export deadline to the end of this year, as well as Indonesia's issuance of 1.1 million mt raw sugar import license. In LNG front, an outage at one of Sakhalin LNG's two trains in Russia last week had an immediate impact on Platts JKM October pricing, jumping 1.275 dollars per MMBtu on August 23 to 11.375 dollars per MMBtu. While repairs are expected in the coming days, a prolonged outage could have significant impact on Asian LNG prices. The highlights in Asia this week: US-China trade war escalates, Middle East struggle to find buyers in the spot market, supply glut drags down sugar prices and LNG prices jump following an outage in Russia. But first, the US-China trade war escalated last week, with China targeting US oil products and coal for the first time with a 25% tariff in response to another round of US tariffs. Commodity markets will continue to watch the implications of this latest development on trade flows. 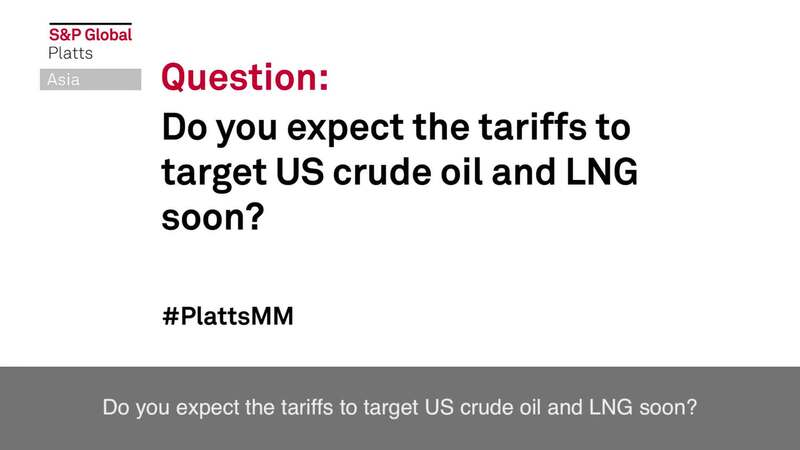 Do you expect the tariffs to target US crude oil and LNG soon? Share your thoughts on Twitter with hashtag PlattsMM. Elsewhere in oil, light sour Middle Eastern crude grades may struggle to sell in the Asian spot market this week amid strong competition as US Eagle Ford crude and condensate is actively being marketed to Asian refiners. Refiners could also turn to Far East Russia's ESPO blend crude as Abu Dhabi's light sour Persian Gulf grade Murban continues to command a distinct premium over its Russian rival, averaging 68 cents per barrel so far this quarter. In the sugar market, front-month New York No. 11 raw sugar futures plunged to over a 10-year low on August 22nd to 9.91 cents per pound, amid a global supply glut, weaker Brazilian real and Indian Rupee. Adding to the bearishness, the Indian government has announced the extension of the 2 million mt sugar export deadline to the end of this year. Concurrently, 1.1 million mt raw sugar import license issued by Indonesia for H2 was lower than some market estimates, adding to supply overhang. Currency volatility and both policy announcements will keep the market on its toes this week, engendering concerns that NY No.11 might continue lower. In shipping, a slowdown in naphtha flows from the Middle East to the Far East is weighing on freight rates. Fewer shipments have taken their toll on the earnings of shipowners, which are barely 6,000 dollars and 4,500 dollars for LR2s and LR1s. In Suezmaxes, crude shipments for Iran loadings are commanding hefty premiums as many shipowners are staying away due to the US sanctions. The freight for Iran loadings is expected to rise further this week. On the LNG front, an outage at one of Sakhalin LNG's two trains in Russia last week had an immediate impact on Platts JKM October pricing, jumping 1.275 dollars per MMBtu on August 23 to 11.375 dollars per MMBtu. While repairs are expected in the coming days, a prolonged outage could have significant impact on Asian LNG prices as the liquefaction facility maintains robust supply linkages to KOGAS and several Japanese power utilities. That's it for this week. Thanks for kicking off your Monday with us and have a great week ahead.